The iasoberg model is currently being used to identify and forecast severe weather activity in the continental US. The model is currently undergoing scientific validation (9-year hail study) regarding days during a particular year with the potential for the occurrence of a large number of hail events on particular days, during a particular year. Similarly, the output is undergoing validation (2-year tornado study) for tornado outbreaks on particular days. There has been some success in both endeavors, leading to further refinement of the model. 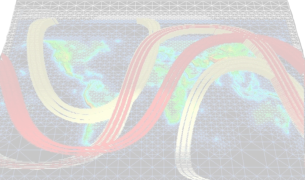 In addition, the model has demonstrated strong correlation with a number of geophysical phenomena, including not only earthquakes, tornadoes and other severe weather events (such as hail), but also landslides/earth movements and clear air turbulence that affect aircraft. What use is an iasoberg in my life? As a subscriber to the Iasoberg Model, you would be able to view the output of the model in relation to current weather and various geophysical events (some of which will be a major event) in or near your location; such observations also apply to any instants past or future. In addition to work on forecasting the potential for severe weather activity in the continental USA, the model is being used to identify the possible timing and locations for 7+ earthquakes based on past 8+ earthquakes. Subscription would also provide you with updates in real time. We are also currently conducting investigations into the correlation of the output of the model with US government study on Total Electron Content (TEC), the importance of which is stressed by the Space Weather Prediction Center. Preliminary investigation has also been completed on the correlation of the output of the Iasoberg Model and data re: Clear Air Turbulence (CAT). The role of CAT is benign at present, merely resulting in air passenger discomfort; yet with the effects of global warming increasing at an incredible rate, CAT will become a significant factor in air travel. The Iasoberg Model could have a major role in predicting travel conditions in the near future. What exactly are iasobergs - pronounced (ice-o-bergs)? A new word was conceived to describe a very small force that is unexplained by the current theory of gravity - iasoberg. The term is also applied to a graphic representation of a region on the surface of the Earth, where this very small force exists at a particular instant. The Iasoberg Model defines this very small force resulting from what has been names the Allais Effect in regions in, on and near the Earth. 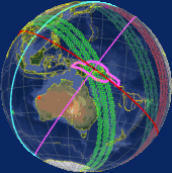 These regions are shown as bands and lines (axis) on the Earth’s surface, typically defined and seen by a mapping application such as Google Earth. The small change in the known forces in these regions is based on the concept that the gravitational fields of the Sun and black hole at the center of our galaxy are deformed, in a similar manner to a space-time field that is deformed by a massive body in space. The Allais Effect was first observed by Professor Maurice Allais in a experiment using a pendulum in June 1954 during a solar eclipse. His observations have been repeated in other eclipses since then. The Iasoberg Model is comprised of a number of elements which include the regions on the Earth’s surface where the Solar and Galactic gravitational fields are deformed at a particular time. The model generates these regions for display on the Earth’s surface very accurately for any instant between 2500BC and 2500AD. Correlating past cataclysmic events with the locations of iasobergs at that point in time will lead to even more precise prediction of future cataclysmic event, thus giving rise to advanced warning systems. The savings in lives and property damage could be astronomical. Read on to delve into the more technical Aspects and why you should subscribe. What good is an iasoberg? The iasoberg model is currently being used to identify severe weather activity in the continental USA. The model is currently undergoing scientific validation regarding days during a particular year with the potential for the occurrence of a large number of hail events on particular days, over a 9-year period. Similarly, the output is being used to identify the potential for tornado outbreaks on particular days during a 2-year study. There has been some success in both endeavors, leading to further refinement of the model. In addition, it has demonstrated strong correlation with a number of geophysical phenomena, including not only earthquakes, tornadoes and other severe weather events (such as hail), but also landslides, and clear air turbulence for aircraft as well. A new word was conceived to describe a very small force that is unexplained by the current theory of gravity - iasoberg. The term is also applied to a graphic representation of a region on the surface of the Earth, where this very small force exists at a particular instant. The Iasoberg Model defines this very small force resulting from what has been names the Allais Effect in regions in, on and near the Earth. 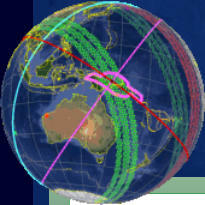 These regions are shown as bands and lines (axis) on the Earth’s surface, typically defined and seen by a mapping application such as Google Earth. The small change in the known forces in these regions is based on the concept that the gravitational fields of the Sun and black hole at the center of our galaxy are deformed, in a similar manner to a space-time field that is deformed by a massive body in space. The Allais Effect was first observed by Professor Maurice Allais in a experiment using a pendulum in June 1954 during a solar eclipse. His observations have been repeated in other eclipses since then. The Iasoberg Model is comprised of a number of elements which include the regions on the Earth’s surface where the Solar and Galactic gravitational fields are deformed at a particular time. The model generates these regions for display on the Earth’s surface very accurately for any instant between 2500BC and 2500AD. Correlating past cataclysmic events with the locations of iasobergs at that point in time will lead to even more precise prediction of future cataclysmic event, thus giving rise to advanced warning systems. The savings in lives and property damage could be astronomical. Read on to delve into the more technical aspects and why you should subscribe .